Scammers use a variety of tactics to get users to give out personal information. One very common tactic is known as phishing. Phishing is a scam where tech-savvy con artists use spam and malicious websites to deliver malware, or to trick people into giving them personal information such as social security numbers, bank account numbers, and credit card information. A more targeted (and often more dangerous) type of phishing is known as spear phishing. Spear phishing is a targeted attack that’s usually addressed to a specific individual. With spear phishing, the perpetrator knows something personal about you. He may know your name, email address, or the name of a friend, or he may have information about a recent online purchase you made. While most phishing emails will have a generic greeting such as “Dear Sir or Madam,” a spear phishing email may address you by name, such as “Hello John.” It may also appear to come from someone you know. According to Allen Paller, director of research at the SANS Institute, 95% of all attacks on enterprise networks are the result of spear phishing attacks. Earlier this year, Symantec issued a warning about an ongoing spear phishing attack targeting small and midsize businesses in the United States, India, and the UK that infects users with a remote access Trojan (RAT). A RAT gives an attacker remote access to a machine & can lead to disclosure of sensitive information and financial losses. Based on campaigns run by Symantec’s Phishing Readiness technology, on average, employees are susceptible to email-based attacks 18 percent of the time. How can You Protect Yourself & Your Business? Protecting your company from spear phishing attacks is the responsibility of employees as well as the mail server administrator. For employees, user education is key. This post contains helpful email safety tips for end users. For the administrator, implementing DKIM, SPF and DMARC can help reduce data breaches, financial losses, and other threats to your business. These three methods are described in greater detail below. An encrypted public key is published to the sending server’s DNS records. Each outgoing message is signed by the server using the corresponding encrypted private key. For incoming messages, when the receiving server sees that a message has been signed by DKIM, it will retrieve the public key from the sending server’s DNS records and then compare that key with the message’s cryptographic signature to determine its validity. If the incoming message cannot be verified then the receiving server knows it contains a spoofed address or has been tampered with or changed. A failed message can then be rejected, or it can be accepted but have its spam score adjusted. Another technique to help prevent spoofing is known as SPF. SPF (Sender Policy Framework) allows domain owners to publish DNS records (SPF records) to identify those locations authorized to send messages for their domain. By performing an SPF lookup on incoming messages, you can attempt to determine whether or not the sending server is permitted to deliver mail for the purported sending domain, and consequently determine whether or not the sender’s address may have been forged or spoofed. 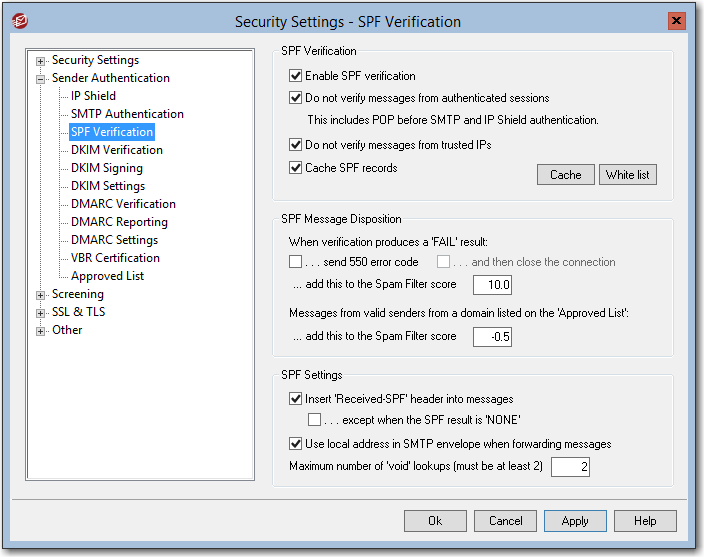 MDaemon’s SPF settings are located under Security | Security Settings | Sender Authentication | SPF Verification. This screenshot displays the recommended settings. These are the recommended settings for verifying SPF records of other domains. To help protect against spear phishing attacks that spoof your own domain, you should set up an SPF record in DNS. You can find helpful information on SPF record syntax and deployment at www.openspf.org. When a message fails DKIM or SPF, it is up to the receiving mail server’s administrator as to how to handle the message. The problem with this is that if DKIM or SPF is not set up properly, it can lead to problems. DMARC (Domain-based Message Authentication, Reporting and Conformance) takes out the guesswork on how to handle messages from a domain that are not properly aligned with DKIM or SPF. DMARC defines a scalable mechanism by which a mail sender can express, using DNS records (DMARC records), domain level policies governing how messages claiming to come from his or her domain should be handled when they do not fully align with DKIM and SPF lookup results. In other words, if you perform SPF, DKIM and DMARC record lookups on a message claiming to come from my domain (example.com), and it does not align with SPF, DKIM, or both, my DMARC record can tell you how I want you to handle messages that are unaligned with SPF & DKIM. My DMARC record can specify whether I want you to accept, quarantine, or reject unaligned messages, and I can even go a step further and specify what percentage of unaligned messages I want you to reject or quarantine based on my policy preferences. This is useful when first deploying DMARC, as it allows you to be more lenient with rejection of unaligned messages until you’re sure DKIM & SPF are configured properly. You can view the following recorded webinar for a more in-depth overview of DMARC, including examples and syntax of DMARC records and deployment strategy. While we must be vigilant against spoofing and phishing attacks, we must also acknowledge that cautious, informed users and properly implemented SPF, DKIM and DMARC policies are the best defense against cybercriminals who are intent on stealing your data and damaging your brand. We’ve added our recent DMARC webinar to our YouTube channel. DMARC (Domain-based Message Authentication, Reporting and Conformance) is an anti-spoofing technology that makes it possible for domain owners to use the Domain Name System (DNS) to inform receiving servers of their DMARC policy, which is how they want those servers to handle email messages that claim to be sent from their domain but cannot be authenticated as having actually come from it. In this webinar, we’ll introduce you to DMARC, describe its purposes and goals, and explain how it works. Then, we’ll show you how to configure MDaemon to use DMARC to verify incoming messages. This webinar focuses specifically on MDaemon’s implementation of DMARC, however, for a more technical and comprehensive overview of DMARC, and as a prerequisite for this webinar, we recommend viewing the Video Training series located at www.dmarc.org. Other webinars, tutorials, and overview videos can be found on our YouTube channel.